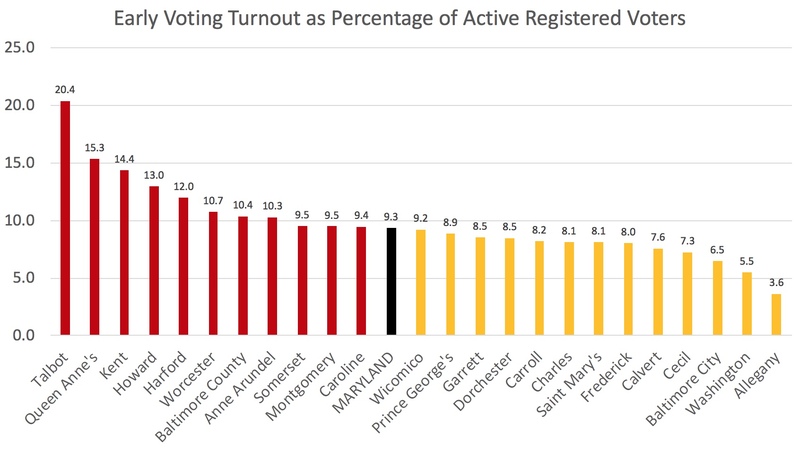 At the end of yesterday, 9.3% of registered Maryland voters had taken part in early voting. Talbot continues to lead the early voting pack as over one-fifth of its registered voters have now cast ballots. Allegany trails at the end with just 3.6% having participated in early voting. Indeed, all Western Maryland counties lag in early voting. Most counties with hot executive races – Howard, Baltimore County and Anne Arundel – continue to have above average turnout but Frederick continues to be an exception. Montgomery has very average turnout despite its comparatively unusual three-way contest. Most counties in CD 1 are also voting at high rates. Dorchester and Cecil continue to lag with Wicomico just below average but closing the gap with the state average compared to yesterday. It’s interesting to see Somerset in the above average category as this relatively poor county often has low turnout. Previous PostMoCo Early Vote Day 5Next PostReally, It’s Not a Youth Wave. It’s a Senior Tsunami.